Take a video tour of our hotel. 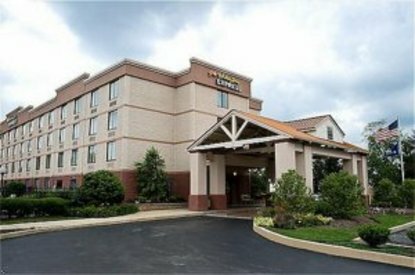 Located just minutes away from QVC Studio Park and Longwood Gardens, The Holiday Inn Express Exton Hotel is your best choice for accessibility, convenience, and superior service in Chester County, Pennsylvania. Perfect for the business or leisure traveler, our hotel is 1 mile from Amtrak train station and minutes from the Philadelphia Airport. There's plenty of space to work and relax with our complimentary high-speed wireless Internet access, 24 hour fitness center, and an outdoor seasonal pool. For a great start to your day begin your mornings with our complimentary award winning &regExpress Start&reg breakfast bar and a hot cup of coffee. After a long day, you can walk on over to one of the eight different restaurants conveniently located in the same shopping center as our hotel. The Exton Square Mall is also located just across the street for additional casual shopping and dining. Finish your night in one of our 124 spacious rooms that offer comfort and luxurious bedding, large work station, and over 40 TV channels. We also offer executive king and queen bedded rooms which include microwave/refrigerators. Our staff prides themselves on providing a warm and welcoming atmosphere, so whatever may bring you into our area, you are always right at home in the Holiday Inn Express &reg Exton. This hotel is committed to providing accessible facilities under the American Disabilities Act. If your accessibility needs are not met, please contact the Hotel Manager on Duty. Should you require additional information regarding accessible facilities for guests with disabilities, please call 1-800-Holiday (U.S. and Canada) or contact the hotel directly. For the hearing impaired, TDD service is available at 1-800-238-5544 within the U.S. and Canada.